The region of Kalbajar is the administrative region of the Republic of Azerbaijan. 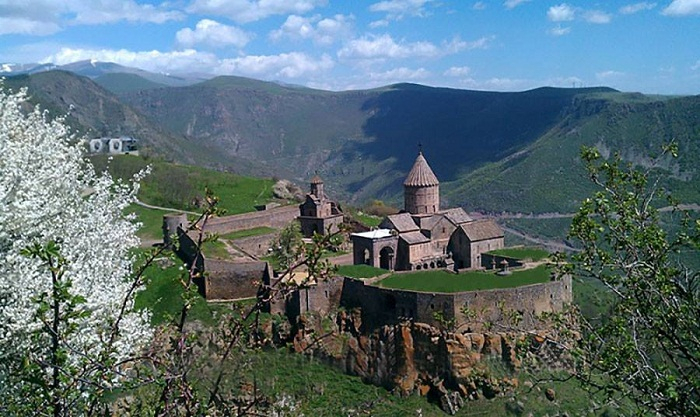 It is situated in the central part of the Minor Caucasus. It neighbours with the Republic of Armenia in the west. Its area is 3050 km2 ; the population is 83,200 (01.01.2011). The central town is the city of Kalbajar. The region has been under occupation of the Armenian armed forces since April 2, 1993. The region covers the following districts and villages: city of Kelbajar; district of Istisu and villages of Zivel; Keshdek; Nadirkhanly; Takhtabashy; Hasanriz; Gozlu; Gozlu Korpu; Narynjlar; Cherektar; Lev; Abdullaushaghi; Garachanly; Agyatag; Fetalilar; Mozkend; Agdaban; Chaygovushan; Agjakend; Orujlu; Zagalar; Tezekend; Yenikend; Ali Bayramly; Vezirkhana; Almalyg; Lachyn; Asrik; Choban Kerekmez; Chorman; Ashaghy Ayrim; Yukhary Ayrim; Boyagly; Baglypeye; Veng; Baghyrly; Bashlybel; Khallanly; Alirzalar; Shahkerem; Chovdar; Dalghylyjly; Otagly; Dereghyshlag; Barmagbine; Otgyshlag; Damirchidam; Ganlykend; Zar; Veng; Yellija; Alolar; Kaha; Hasanlar; Armudlu; Tekdam; Zeylik; Hopurlu; Sheyinli; Zulfugarly; Garaguney; Kechiligaya; Istibulag; Goydere; Agdash; Gamyshly; Baghirsag; Jomard; Garaguney; Najafalylar; Piriler; Kilseli; Alchaly; Gushyuvasy; Gylychly; Guzeychirkin; Alchaly; Merchimek; Aggaya; Chopurlu; Birinji Milli; Ikinji Milli; Uchunchu Milli; Guneshli; Allykend; Boyur; Alchaly; Orta Garachanly; Bash Garachanly; Ashaghy Garachanly; Tatlar; Imambinesi; Kholazey; Alkhasy; Sarydash; Guneypeye; Seyidler; Jamilli; Susuzlug; Gasymbinesi; Synyg Kilse; Bashkend; Tirkeshevend; Zargula; Gazkhanly; Galaboyun; Garakhanchally; Chaykend; Kendyeri; Kilse; Ashaghy Khach; Mishni; Chapli; Elyaslylar; Shaplar; Mammadushaghy; Ashagy Shurtan; Yukhary Shurtan; Soyugbulag; Tekegaya; Babashlar; Bozlu; Chyrag; Tovledere; Mammadsefi; Yanshag; Zallar; Yanshagbine; Dovshanly; Bazarkend; Hayad; Ghyzylgaya; Yukhary Oratag; Vangli; Chormanly; Shahmansurlu; Heyvaly; Devedashy; Yayiji; Imaret Gervend; Chapar; Zerdekhach; Kolatag; Damgaly; Chyldyran and Mehmana. The following educational and social institutions were active before the occupation-. 95 secondary schools; the vocational school; 44 clubs; fine arts school; the museum; the central hospital; the polyclinics; the children hospital; 7 village hospitals; 75 maternity services points and 23 outpatient medical treatment centers. There were also several historical and architectural monuments, including Albanian temples (XIII-XVIII centuries) etc. 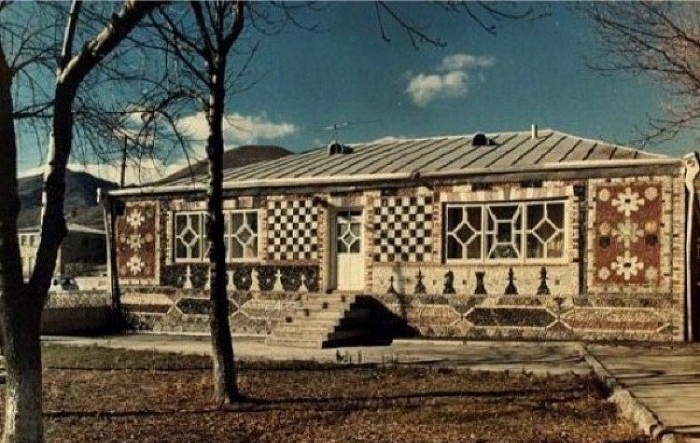 Quite popular in the period of the USSR the chess club started its activity in 1950. Numerous sporting events, meetings and activities were held there. 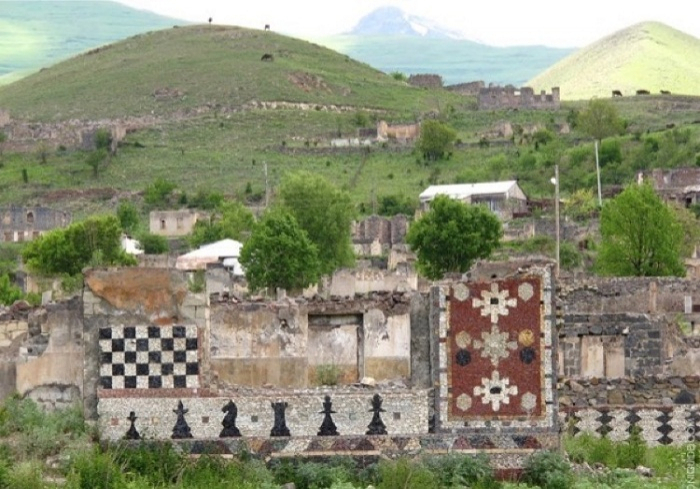 The building of the chess school was completely destroyed after the occupation of Kalbajar region by the Armenian Armed Forces in April, 1993. 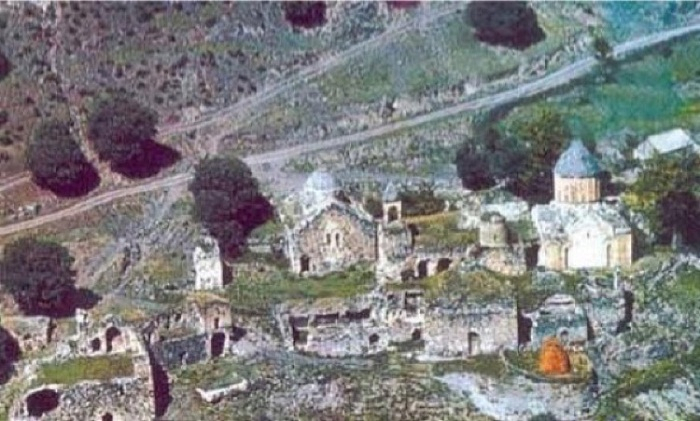 The Ganjasar Monastery located in Vangli village of the Kalbajar region, along with being the headquarter of the Caucasian Albanian Catholicoses, was the shrine of the Jalalids, Albanian kings and catholicoses. The Ganjasar Monastery known as the Khaznadagh Temple in scientific literature, was mostly constructed in the 13th century. The hill on the Khachinchay river where the monastery is located had been found sacred in the pre-Christian era and turned into a pagan temple. 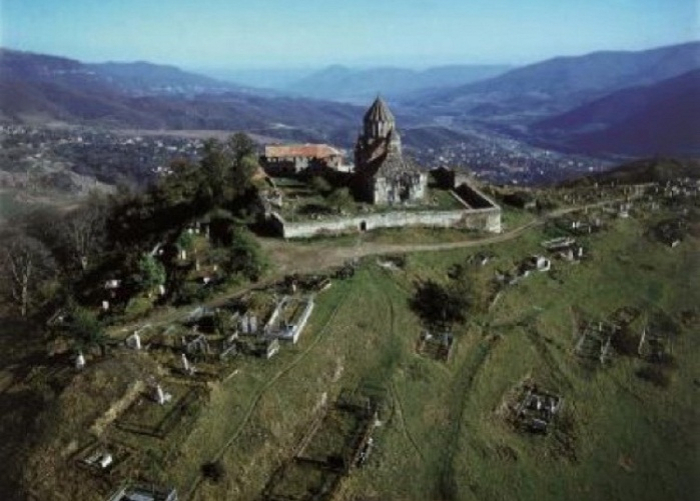 From the 13th to the 19th century the Ganjasar Monastery had been the religious and cultural centre of Caucasian Albania. The complex consists of a church, private entrance hall and supporting buildings. The complex is castle walled, the southern and western parts having a gate each. Cells and supporting rooms join the northern and southern walls. Hasan Jalal, the Albanian king, founded the church next to the southern gate of the complex in the period of 1216-1238. The Seljuk and especially Elkhanids’ periods had a considerable influence on the concept and construction of this valuable monument. Its majestic volume-and-space composition, rich and subtle artistic design, as well as the highest-quality construction, relates to the economic power of Elkhanid state. As the period of Elkhanids’ reign was the top of Azerbaijan’s medieval architecture, the Ganjasar Monastery was also the masterpiece of Azerbaijan’s Turkic-Christian architecture. From 1511, the Ganjasar Monastery had been the headquarter of the Albanian Catholicoses. In 1836, Armenians succeeded in abolishing of the Albanian Catholicity by the decree of the Russian Empire and subordinating the Albanian churches to Echmiadzin Catholicity. 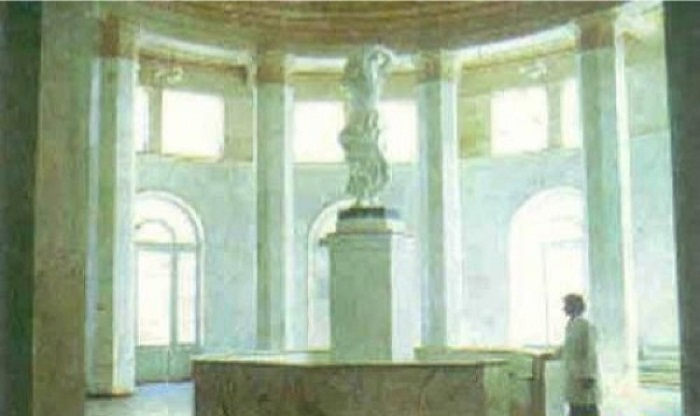 Then, falsifying the history, they presented the Albanian religious monuments as Armenian religious monuments to the world. 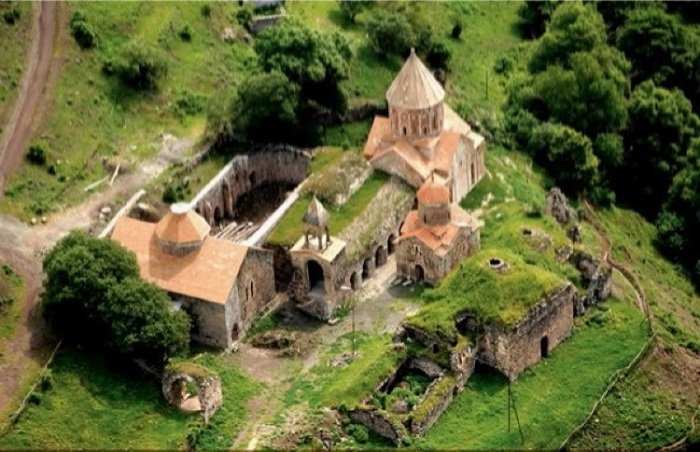 At present, the Armenians misrepresent the Ganjasar Monastery, which is under the occupation of Armenian Armed Forces, as “Ganzasar” Armenian monastery complex to the world. 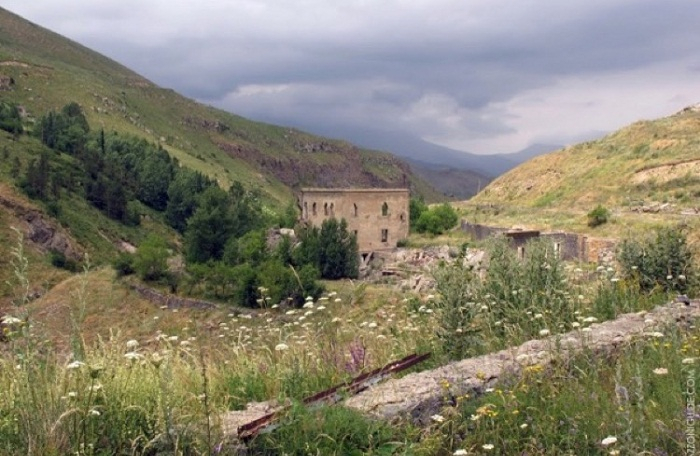 Kalbajar district is famous in the world for its Istisu mineral springs, and “Istisu” health resort. 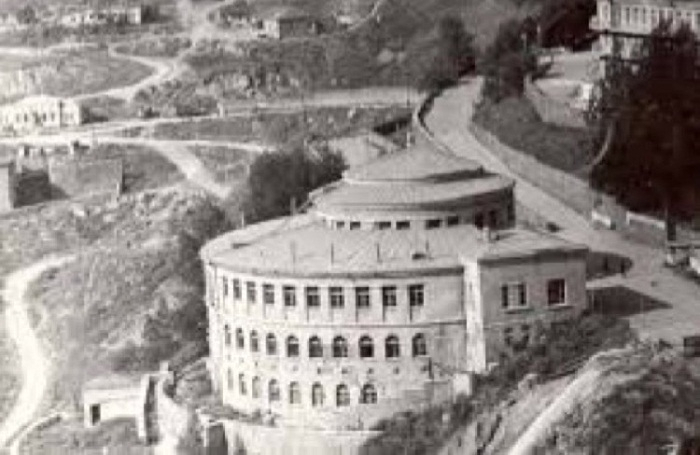 At Istisu there are therapeutic mineral and hot springs where people used to go for treatment of rheumatism and arthritis. 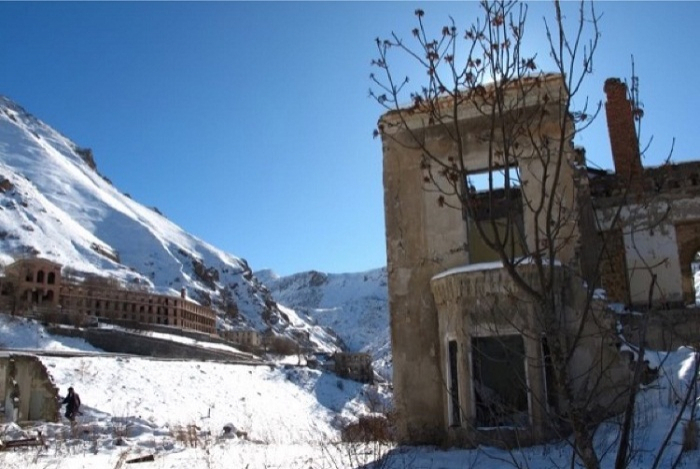 “Istisu” health resort is located in the western part of Kalbajar - on the slope of the mountain range. Istisu mineral springs appeared as a result of an earth tremor and cracking during the earthquake in 1138. 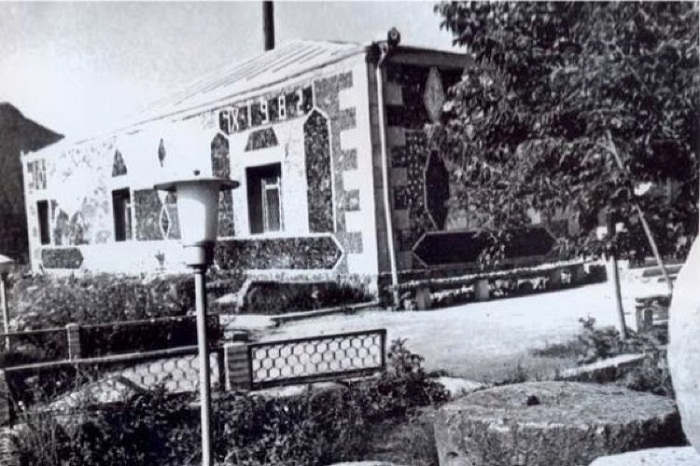 Setting up the health resort in Istisu has been in the spotlight of the Azerbaijani Government since 1925, after the establishment of the Soviet power. Chemical analysis of Istisu mineral water was first made in 1929, while a resort construction commenced in the late 1920s. 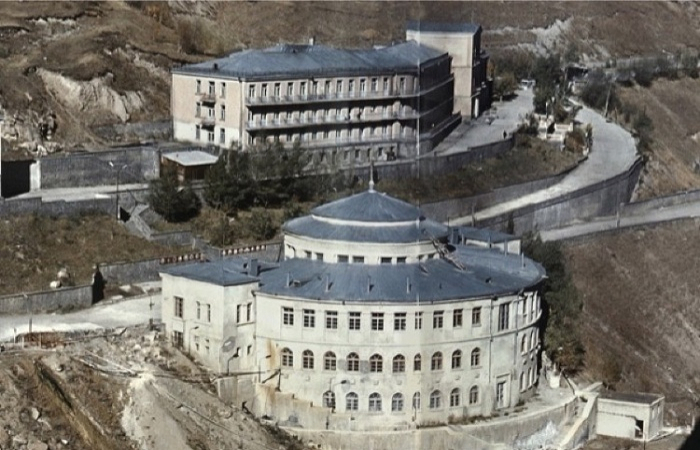 Medical resorts, hospitals and hotels were built in Upper Istisu in 1951. 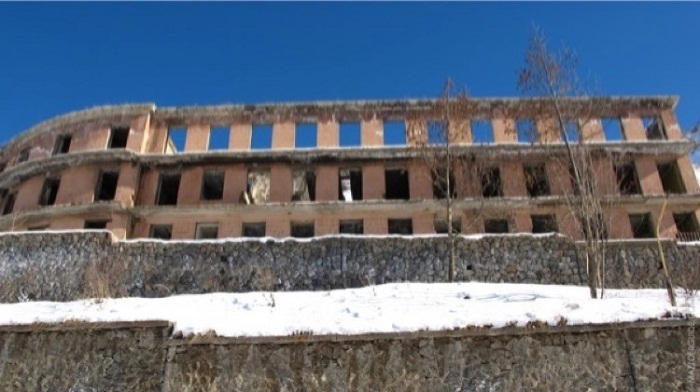 The health resort functioned until the occupation of Kalbajar by the Armenian Armed Forces in April, 1993. Kalbajar History and Ethnography Museum was established in 1982. The museum had more than 900 square meters of courtyard. The museum exhibits were composed of a rich corridor, 3 rooms, 9 exhibition halls, and a collection comprising more than 30 thousand exhibits. The outside walls of the museum were built of stones bearing 2037 color tints. There were different ornaments, drawings of agricultural tools, leopard and wild goat figures, churn, pots, waterskin and many other items engraved on stone. 14 tombstone horse and ram sculptures carved out of stone were exhibited in the courtyard of the museum. The experts also call the Kalbajar History and Ethnography Museum as a geology, archeology, art and sound museum. At that time more than 150 scholars from Bulgaria, India, China, USA, Germany, Italy, Canada, Australia, Iran, Finland and many other countries saw the exhibits of Kalbajar museum, and conducted a study. 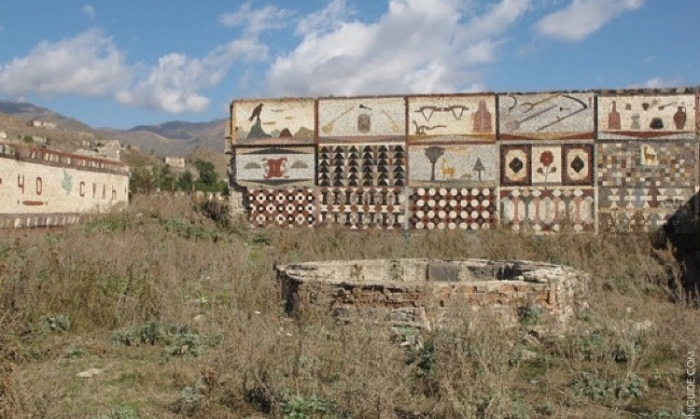 Kalbajar History and Ethnography Museum functioned until the occupation of Kalbajar by the Armenian Armed Forces in April, 1993. It was impossible to salvage majority of its exhibits. Khudavang, or Dedeveng, located in the Vang village of Kalbajar region, on the Terterchay river’s left bank, is one of the largest and most beautiful examples of Azerbaijan’s Christian architecture. By the legend, Apostle Thaddeus, the first Christian missionary in the Caucasus, was buried there. Therefore, the complex is supposed to have been founded in the 4th century. The complex was mainly constructed in the 13th century, in the reign of Albanian king Vakhtang. The monastery complex currently includes more than twenty buildings and ruins. 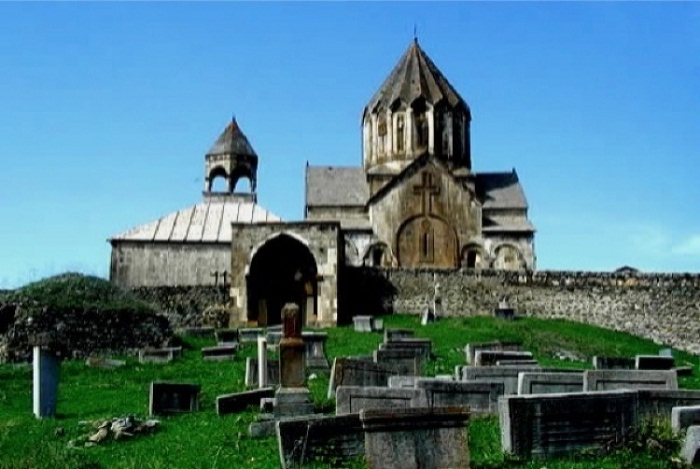 The main church was built in 1214 by Arzu Khatun, king Vakhtang’s wife. Dominating throughout the complex, its dome high and space majestic, the church is of the Caucasian-Albanian Christian masterpieces of architecture. It is believed that, Arzu Khatun and her daughters painted the interior murals. There are fine carvings on the western and northern sides of the church. The main religious part of the complex consists of seven spaces, different in terms of composition, but mutually supplementing. The main building of the complex is the Boyuk Hasan Church. In the southern part, there are civil buildings such as a palace, working and living premises on the slope. The complex buildings fully demonstrate the centuries-old construction culture and versatile types of Azerbaijan’s Christian Architecture. Many construction inscriptions have survived in the Khudavang Complex. a number of names indicated therein such as Arzu, Tursun, Seyti, Asan, Avag, Shams, Altun, Aghbuh, Garagoz, etc. should be considered of exact providing the builders’ Turkic identity. Direct relations to Azerbaijan’s Muslim architecture are clearly felt also in numerous stone-carving decorations of the site. 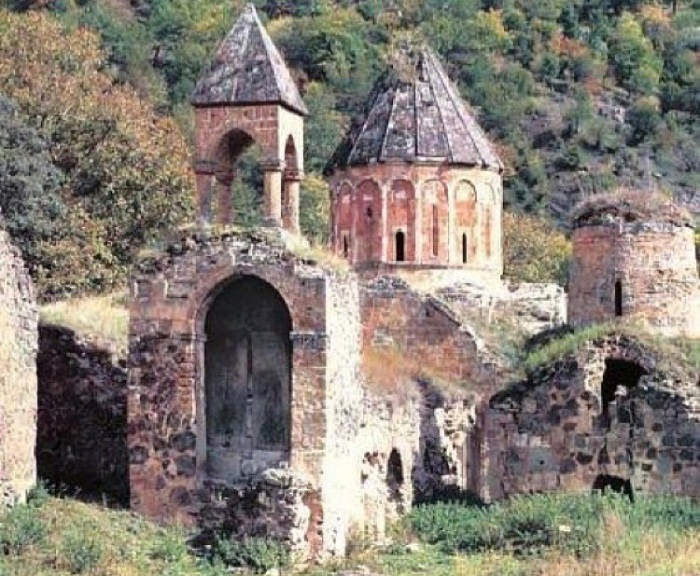 At present the Armenian researchers try to misrepresent the Albanian Khudavang Monastery Complex, which is under Armenian occupation, as the Armenian monument. 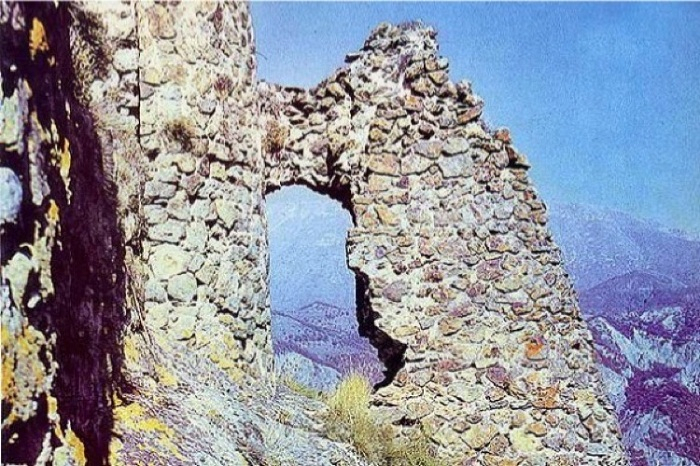 Lev castle is one of the most majestic among the Kalbajar region’s highland ones. It was founded on a high forest mountain’s ridge 600 meters from the Lev River’s right bank, in Ganlikend village. Surrounded by a steep rock and streams form three slides, the castle has an oblong and complicated plan matching the highland relief. The castle can only be entered through the single entrance at the castle’s north-eastern edge if one climbs up by an exclusive narrow path from the north-west. The castle’s internal length is nearly 90 meters, and the width is between 35 and 40 meters. Its internal castle is located at the high south-western corner. 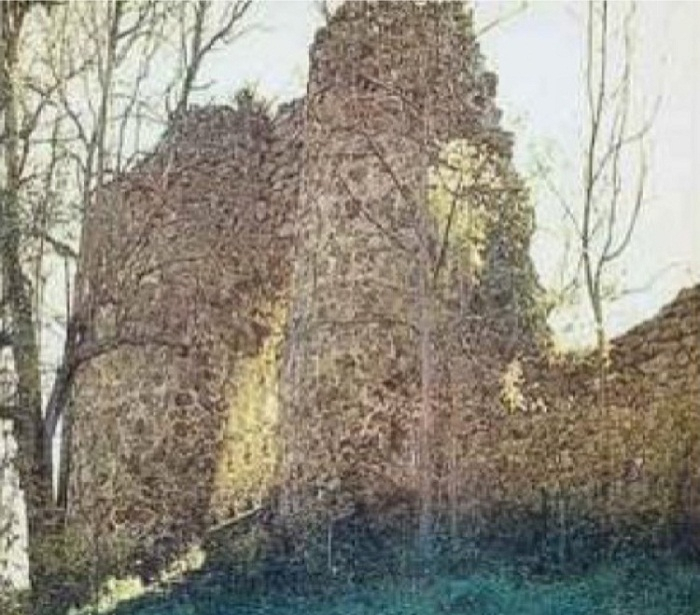 The castle walls were strengthened with several semi-circular towers. The single gate is between two round towers. The average thickness of the castle walls is 1.3 meters. There are ruins, in-rock water basins and food warehouses, etc. There were sentinel derricks and a system of small satellite castles in mountains around Lev castle. One of those mountains has kept the function-meeting name of the castle which is on its top, Garavul (Guard). From there, another castle, Jomard, is observed. Lev castle was constructed in the 13th-14th centuries. 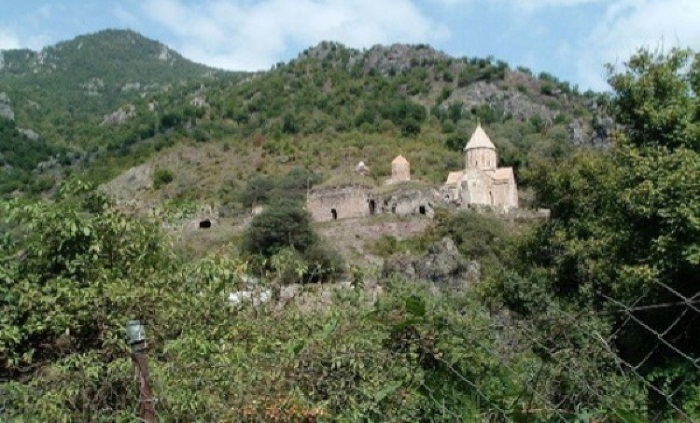 At present the castle is under occupation of the Armenian Armed Forces.